Top Line for years has specialized in manufacturing custom fabricated products designed specifically to meet our customers’ requirements. Our primary objective has always been to design and manufacture these specialty products by using state-of-the-art manufacturing practices and technologies. Top Line and its affiliates employ engineers with a vast range of expertise and knowledge in the bioprocessing and pharmaceutical industries. The benefit of this is our ability to provide quick and accurate solutions to even the most complicated problems that occur in the field. All specialty products are manufactured using good manufacturing practices and are put through a very rigid quality control inspection before leaving our facility. These practices ensure that our customers receive quality parts ready for immediate installation. When bacteria entrapment or leaking gland seals associated with other types of valves problems in the system, the ZERODL™ tank bottom valve is a reliable solution that can be used to eliminate such concerns. 100% BPE Compliant with full material traceability. The ZERODL™ tank bottom valve, with its conical profile allows for complete drainability and the prevention of deadlegs or entrapment areas. 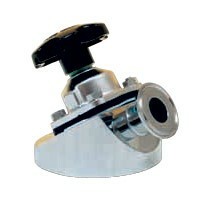 These valves are installed by either bolting or welding to the tank surface. ZERODL™ tank bottom valves are available in sizes ranging from 1/4” through 4”, are manufactured using type SA-479 316L stainless steel and are available with a wide variety of drain ports and end connections. Positive closure can be achieved by means of manual or pneumatic actuation. Top Line offers many surface finish option to meet your specifications. In addition, heat number are etched into the body providing full traceability with mill test summaries provided.